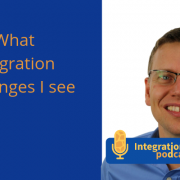 In this podcast about Figaf´s Integration Regression Tool I take a look at some of the challenges, that SAP is facing with integration. As an independent developer of both tools and courses regarding SAP I get to talk to quite a few customers when presenting my tool. And I can see how the tool can help them in the process of planning their workflow. Key question: Where is your architecture? Many people working with SAP are struggling with understanding CPI and how it should fit into their organization. There seems to be a spike in the number of requests for projects, and the developers have to skilled in both CPI and PI. It is of course very important to ensure that the developers do not break anything. The key question is where your architecture should be. What kind of impact it will have. CPI is quite a different way to monitor than PI. 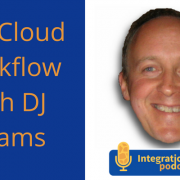 I’m excited to welcome DJ Adams to The Integration Podcast this week. DJ has been working with SAP software for more than 30 years. He was an SAP Mentor for many years but has since retired to become an SAP Mentor alumnus. DJ has shared a lot on the SAP Cloud Platform Workflow. He has also written a series of blog posts on the subject where he is using the platform to find which beers he needs to drink next. With my background on the SAP PI systems and BPMs there now is a gradually transitioning to the cloud so DJ’s experience is hugely valuable for my work. DJ first started working on R/2 on IBM mainframes in the 1980’s and has been working with SAP software ever since. He has been fascinated by the cloud platform and has worked with systems outside of the SAP world including Google App Engine. He never worked much with PI but the workflow service is very closely related to SAP BPM. Getting started with Workflow is really easy. It’s available as a trial account on the Cloud Platform. Users can easily enable it along with the Portal Service and the full stack Web IDE. You need to define your workflow definitions. You need nothing other than a web browser to access those services. The workflow service is about orchestrating services and tasks across applications but also across systems, organizations, and individuals. There is a service task building block that effectively gives you the ability to make HTTP calls. You also have script tasks that will let you mess around with the context of the data of the workflow instance. There is also a mail task. Then there is the most important step type in a workflow definition which is the user task. Those let you send tasks to a user to let them be able to interact with that workflow instance. You don’t need to code very much in the UI when you’re first getting started. But if you are going to do any meaningful workflows you will need to do some coding to create user task interfaces for the SAP Fiori My Inbox app, which is a master-detail style app. The user task components you build are injected into the component container in the My Inbox app when tasks are selected for processing. You need to know some SAPUI5 in order to do that, but the team plans to release a forms-based facility to create user task interfaces in the future.